Systems for archiving store data with unchangeable content and digital information in its original form, which in the future will not change. Examples of such data are contracts, financial documents, medical records, etc.. Archiving systems must store data in an efficient and optimal manner, while at the same time satisfy all business procedures and standards for the protection and safeguarding of information. EMC Centera is an IP Network Storage platform specially designed for digital archiving of original content that is scalable. This solution guarantees the authenticity of the content, redundancy, and ease of access. The platform is completely open, compatible with all types of data and applications, and on the other hand is completely independent from the infrastructure with which it is connected. It has a WORM (Write Once Read Many times) certification, which guarantees unchangeability of the content. In other words, the original user’s content cannot be deleted or changed as long as there is period with defined duration for protection of data or data sets. 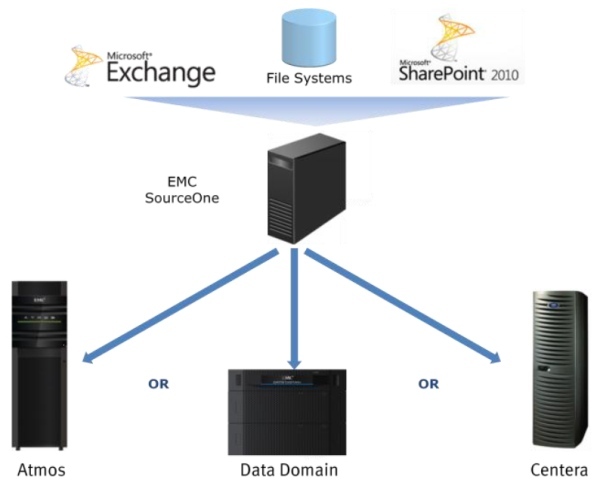 EMC SourceOne is a solution designed to archive e-mail servers, file servers, Microsoft SharePoint Servers etc. and to allow the user to comply with regulations pertaining to this type of data storage.When we talk about e-mail servers, EMC SourceOne can archive content and process with Microsoft Exchange, IBM Lotus Domino and SMTP mail server. Archived content is stored in so-called EMC SourceOne Native Archive.